CryptoKitties, the popular game of breeding and collecting cats on the Ethereum blockchain, has seen a huge surge of sales over the last couple of days, driven by demand for its ‘fancies’. According to the community created website Kitty Explorer, over 693 fancy cats changed hands within the last week, with the maximum price of 20 ETH. Fancy cats are special cats created in the CryptoKitties app that can be bred using a specific combination of genes until a limit is reached (limit can be time-based or total number of fancy cats based). Fancy cat recipes are created by Axiom Zen, the creator of CryptoKitties, and is not recorded on the blockchain per se. The actual ownership of the cats in CryptoKitties is recorded on the blockchain, and players use third-party extensions like Metamask to buy, sell, and breed the digital cats. CryptoKitties received a lot of press in December 2017 when a single cat sold for over $100,000. For a while, its popularity caused significant delays on the Ethereum blockchain and increased the gas price. Since those days, however, the activity on the game has dropped precipitously. Over the last two days, even though the number of players measured by unique addresses hasn’t gone up much, the total sales volume has exploded. This has mostly been due to a few CryptoKitties players valuing specific ‘fancies’ – the ones that were the earliest created. Axiom Zen marks the fancies in the order in which they were bred. The first created fancies of each type are suddenly being valued at significant amounts. Players have sold the #1 fancy cats for over 20 ETH over the last two days – over $5000 per cat. This may seem like a far cry from its heyday. However, many ordinary players have participated in these fancy sales over the last few days. At least when it comes to the fancy market, CryptoKitties may just be bucking the broader crypto bear market. CryptoKitties has several dimensions of rarity for the cats. Collectors value different things in the cats, from generation to genes. 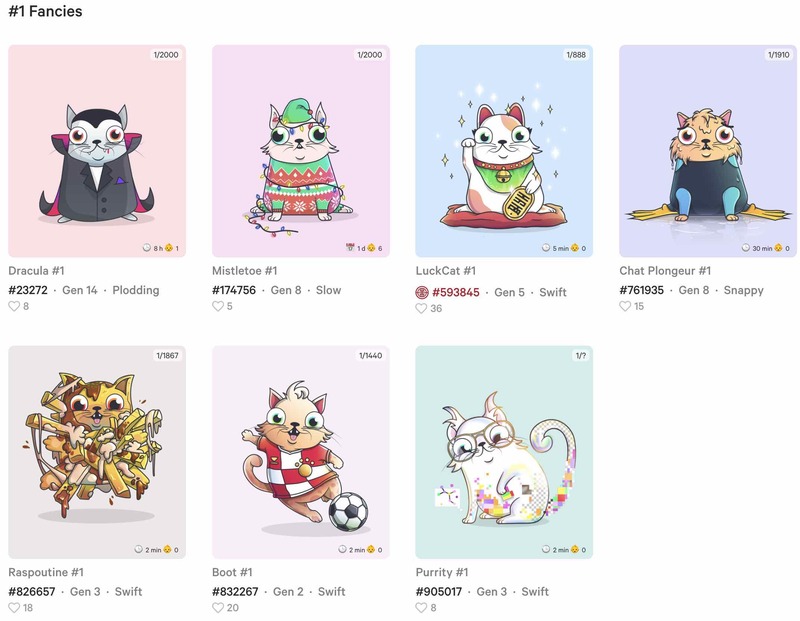 Fancy cats have a unique appearance on the CryptoKitties app and are therefore valued higher by collectors. Up until now, most of the fancy cats were valued based on generation and condition. A lower generation was usually valued higher, and cats in mint condition, i.e. cats that hadn’t bred, were valued higher. Over the last few days, however, collectors began swooping up lower numbered fancies irrespective of their generation and condition. Part of the reason may be due to a leader-board created at cryptokitties.city website, managed by a community member. Whether the trend can last remains to be seen. For one, new fancy cats are minted at the discretion of Axiom Zen, and therefore there is no limit per se to the number of #1 fancies. This is unlike the fancy cats themselves that have a limit. For example, the rarest fancy cat in the game is Schrodinger Cat – only 73 of those exist and can ever be created. There may also be a rebalancing of value within the game. Factors like generation and condition may once again become more important in valuing fancy cats. At the end of the day, however, cats are as valuable as collectors and speculators are willing to pay for them. If collectors value specific attributes more than others, the market will follow. Right now, it seems like that is lower numbered fancies.